The front of the home is shown with a seating area and a dinette. 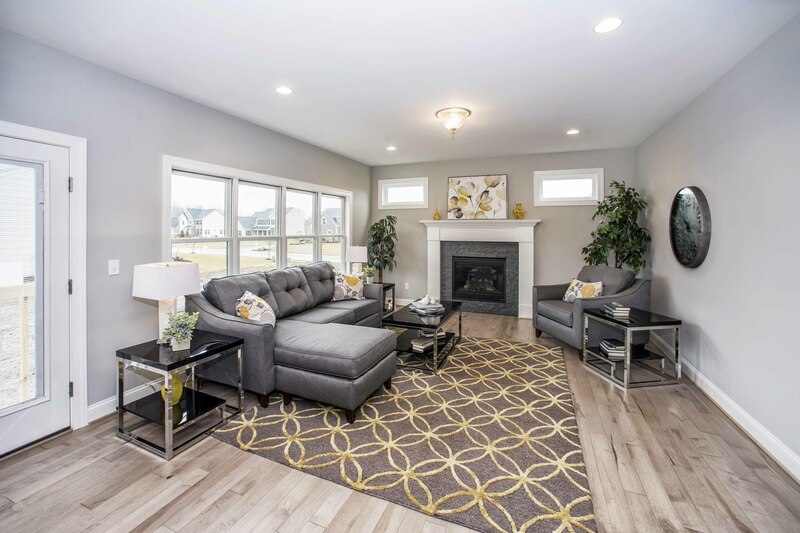 Located on a corner lot in Orchard Park’s Pleasant Acres community, Natale Builders has its Hamlet model move-in ready and waiting for buyers. The three bedroom, 2.5 bath home with a two car garage makes a great first impression with its handsome curb appeal that includes cultured stone and a covered front porch. The home also sits along a very quiet street with no through traffic, making it perfect for a family. At 2,080 square feet, the front door is flanked by two side windows as well as a transom above that resemble an Arts & Crafts-style stained glass design. The bright two-story foyer opens into the first floor living space to the left. The entire level is done with a beautiful light gray knotty maple hardwood throughout. 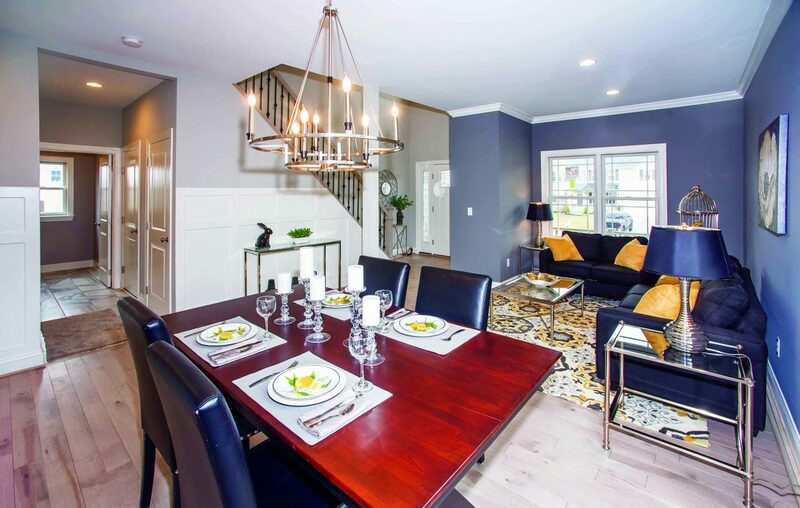 The front-to-back layout starts with a living room and dining area combination in an open concept arrangement. Built in bookcases flanking the entrance to the kitchen add a classic touch to the modern design. In fact, custom trim work throughout adds elegance to each room. The dinette leads to the kitchen with built in bookcases. 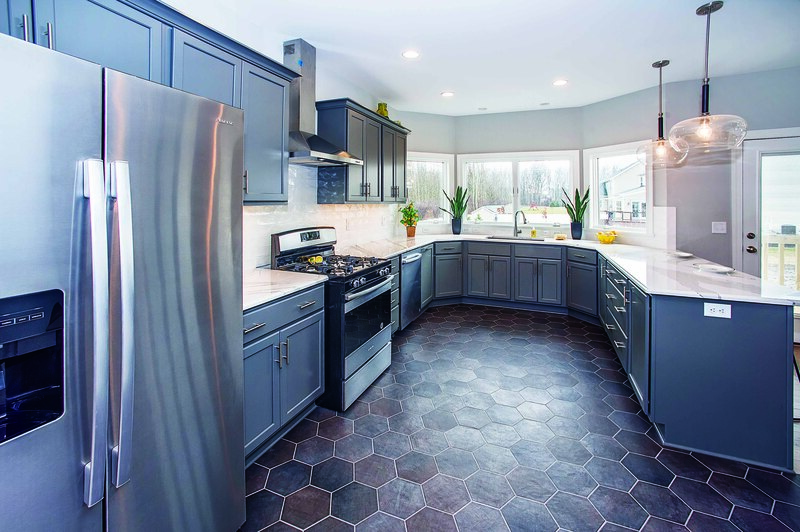 The gorgeous kitchen is done with dark gray and brown honeycomb tile pattern on the floor and gray cabinets. The dark colors are set off by white quartz countertops and gray subway tile. Stainless steel appliances and a stove hood give the kitchen a chic modern farmhouse feel. The kitchen doesn’t lack for storage either. In addition to the many cabinets, there is a large pantry. The kitchen features a unique honeycomb tile floor, gray cabinets and crisp, white quartz countertops. The U-shaped countertop arrangement creates an island with informal seating at the breakfast bar. Unique Edison bulb light fixtures hang above the island. Plenty of windows, including a bay of windows surrounding the kitchen sink bring in plenty of natural light. A door near the leads outside. The kitchen opens to the great room, with even more windows and a beautiful gas fireplace done with gray stone, offset by a sharp white mantel. The kitchen opens to the living room with a gas fireplace. The first floor layout is efficient with the kitchen at the heart of the action, flanked by the dining area and sitting room on one side, and the great room on the other. It’s easy to envision many family gatherings with plenty of space for everyone. Also located on the first floor is a half bath, the entrance from the garage and a large first floor laundry room. The large master suite has an equally large walk-in closet that provides an immense area of storage space. The master bath is bright, done in white and gray tones. The huge walk-in shower includes shelving as well as a seat. The dual sink vanity is also oversized, with granite countertops and tons of cabinet storage space. There is a linen closet too. A compartmentalized toilet adds privacy. The remaining two bedrooms share a main bath with a tub/shower arrangement. Each bedroom has its own large closet. Also on the second floor are two additional linen closets. 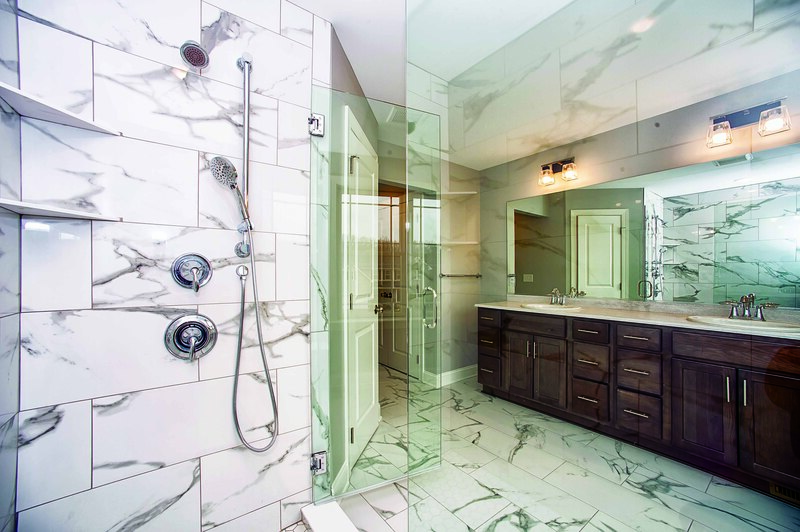 All bedrooms are carpeted, while there is tile in all the baths. What’s not visible but just as important are the energy efficient features Natale Builders includes with its homes. Natale believes in building homes from the inside out. High R walls, air sealing, no/low VOC materials and clean air exchanges are standard in this home as are 8’ Superior basement walls and energy efficient appliances. Natale also uses Andersen 200 series windows. The home at 62 Golden Crescent is conveniently located just off Route 219, at the 20A exit and the village of Orchard Park with its shopping and dining options. Also nearby is the Quaker Crossing retail area and theaters, as well as the McKinley Mall shopping area. The school system is also the highly rated Orchard Park district. The home is priced at $459,900. The Hamlet model can also be built on your own lot or on any available homesite on Cooper Ridge in Pleasant Creek (Hamburg). 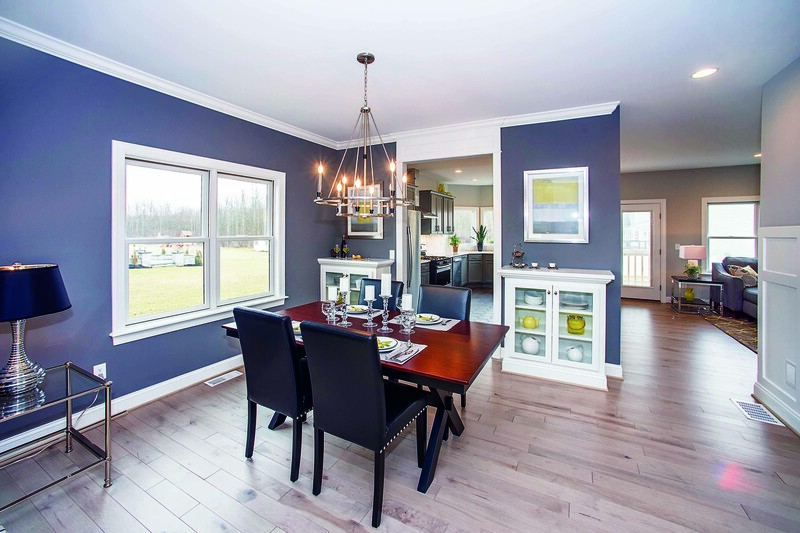 To tour the home or for more information, contact Natale Builders at (716)580.3318 or jess@natalebuilders.com.